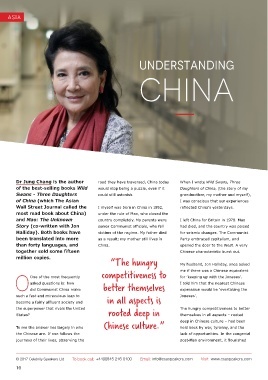 Wall Street Journal called the          I myself was born in China in 1952,    reflected China’s yesterdays. together sold some fifteen                                                     Chinese characteristic burst out. asked questions is: how       in all aspects is                    for ‘keeping up with the Joneses’. become a fairly affluent society and     Chinese culture.”                     Joneses’.